Spanking Bethie » A New Paddle and a Contest! A New Paddle and a Contest! 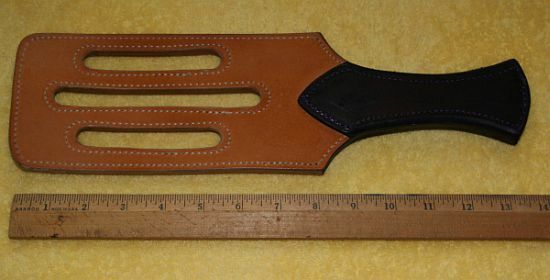 We just received this new paddle from John of Leather Thorn Paddles and we’re thrilled with it! It has lots of good sting and is of the usual excellent quality that John is known for. We’re having lots of fun with it already. What is so great about this paddle is that you can win one for your very own self! John is having a “Name This Paddle Contest” and the winner will receive one of these paddles as the prize. It’s a wonderful paddle so get your imagination in gear and come up with a name for this lovely. I know a lot of us spankos like to think up names for our toys and with a prize like this, I bet you good people won’t have any problems coming up with something suitable. You’ll have to hurry because you only have until December 7th. I have to admit I’ve called that paddle a name or two at different times, but they’re not fit for any contest so it’s a good thing I already have this paddle. Dan on the other hand (and on the other side of the paddle) has taken to calling it “The Corrugator.” Why? Because he thinks that if used with enough vigor, the slots in the paddle will leave impressions that will make my bottom look corrugated. I’d be outraged, but I’m kinda curious about that myself so I guess more experimentation is needed. Curiosity is a good thing, right??? When I saw the holes, the first thing I thought of was flipping pancakes. Of course, if you want to go for a pun, Slap Jack is just as clever. Oh my god, me too! Although I must admit, it triggered my salivary glands more than my spanko tendencies. I highly contemplated “whipping” up a batch of pancakes and bacon after looking at the picture. I have to compliment you on that most fabulous pun. In my opinion, the groanier the pun…THE BETTER! Hell, if I were judging that contest, I would declare you the winner! It looks wonderful, whatever it’s called. I’ll have to ponder that one (quickly).